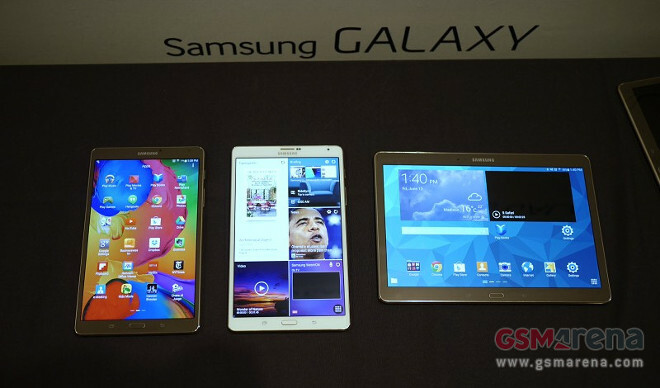 The Samsung Galaxy Tab S 8.4 and Galaxy Tab S 10.5 were announced at the Premiere event a couple of days ago. They’ve been up for pre-order in the US since yesterday, and now it’s the UK’s turn. Starting today, you can pre-order the tablets at PC World, and they’re both expected to start shipping on July 4. They will become available in-store the following day, if what a tipster told Android Central is accurate. The Galaxy Tab 8.4 is priced at £329.99, while the 10.5-inch model costs £419.99. In both cases, we’re talking about the Wi-Fi-only versions of course, as the LTE-capable ones are still a long way from hitting the streets. If you pre-order either of these tablets, you’re getting 16GB of expandable internal storage, 3 GB of RAM, and a touchscreen with 2560×1600 resolution. Running the show is the Samsung Exynos 5 chipset with an octa-core CPU that has four 1.9 GHz ARM Cortex-A15 high performance cores and four 1.3 GHz ARM Cortex-A7 battery-friendly cores. There’s an 8 MP camera on the rear, and a 2.1 MP front snapper, and Samsung’s TouchWiz is overlaid atop Android 4.4 KitKat. If you want to learn more about the Galaxy Tab S line, have a look at our hands-on.